Reliability of construction in earthquakes is greatly affected by the materials used for the constituent elements of structure, architecture, and equipment. It is seldom possible to use the ideal materials for all elements, as the choice may be dictated by local availability of local construction skills, cost constraints, or political decisions. (5) ease in making full strength connections. Generally, the larger the structure, the more important the above properties are. By way of illustration, the applicability of the major structural materials to buildings is given in Table 8.3. The term 'good reinforced masonry' refers to properly detailed hollow concrete blocks as discussed in Section 10.4.4. 1 These two materials only just qualify for inclusion in the medium-rise bracket. Indeed, some earthquake engineers would not use either material in these circumstances. Most fully precast concrete systems are not well suited for highly ductile earthquake resistance, because of the difficulty of achieving a monolithic and continuous structure. The order of suitability shown in Table 8.3 is, of course, far from fixed, as it will depend on many things such as the qualities of materials as locally available, the type of structure, and the skill of the local labour in using them. All these factors being equal, there is arguably little to choose between steel and in situ reinforced concrete for medium-rise buildings, as long as they are both well designed and detailed. For tall buildings steelwork is generally preferable, though each case must be considered on its merits. Timber performs well in low-rise buildings, partly because of its high strength-weight ratio, but must be detailed with great care. Further discussion of the use of different materials is given in Chapter 10. Developing countries have special problems in selecting building materials, from the points of view of cost, availability, and technology. Further discussion of these factors is given by Flores (1969). The choice of construction material is important in relation to the desirable stiffness (Section 8.3.6). It is worth bearing in mind while choosing materials that if a flexible structure is required then some materials, such as masonry, are not suitable. On the other hand, steelwork is used essentially to obtain flexible structures, although if greater stiffness is desired diagonal bracing or reinforced concrete shear panels may sometimes be incorporated into steel frames. Concrete, of course, can readily be used to achieve almost any degree of stiffness. A word of warning should be given here about the effect of non-structural materials on the structural response of buildings. The non-structure, mainly in the form of partitions, may greatly stiffen an otherwise flexible structure and hence must be allowed for in the structural analysis. This subject is discussed in more detail in Section 8.3.8. Underlying the principle of failure mode control is the assumption that structural elements of a certain minimum strength will be provided, as required by the strength limit states of codes of practice (Section 8.2). This means that some overall probability of failure should not be exceeded. For structures which are required to be stiff, or for those which are inherently brittle, it may suffice simply to design the structure to remain elastic in the design earthquake, i.e. to conform with item (2b) in Table 8.1. (2) those involving sudden failure (e.g. brittle or buckling modes). While the above principle is good practice for any type of loading, it is particularly important for moderate to strong earthquake loading, because such loading is often so much more demanding on structures than other environmental loadings, and generally involves stress incursions well into the post-elastic range in the parts of the structure. It is therefore highly desirable to control both the location and the manner of the post-elastic behaviour, i.e. to design for failure mode control. 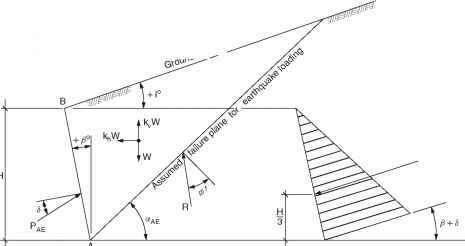 To reduce the probability of occurrence of failure modes (1) and (2) above, earthquake codes commonly have requirements that give added strength (i) to vertical load-carrying elements and (ii) to members carrying significant shear or compressive loads. Figure 8.9 illustrates alternative failure modes for a multi-storey moment resisting frame. 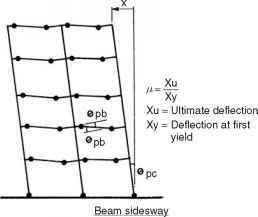 Clearly, the column sidesway mechanism is less desirable than the beam sidesway mechanism, as the former will lead to earlier total collapse than the latter. However, while it is possible and desirable to design so that plastic hinges form in beams rather than columns, it is not possible to eliminate plastic hinges from vertical structure completely. A number of potential plastic hinge zones are generally required in the lowest level of columns or walls even in the preferred failure mode, as in Figure 8.9(b). While beam-hinging failure mechanisms are obviously preferable, the desired configuration for a structure sometimes dictates that a column-hinging failure mode cannot be avoided. In this case, in line with the above philosophy, some earthquake codes require that the structure be designed for a higher level of loading. In the general case, the number of possible failure modes increases with increasing number of elements, and plastic hinges are likely to form at different locations in different earthquakes (Sharpe and Carr, 1975). Detailing for plastic hinge control may not be sufficient based on solely linear frame analysis, because hinge positions do not necessarily occur only at the locations of maximum moment indicated in a linear analysis. Figure 8.9 Alternative plastic hinge mechanisms for a typical multi-storey frame uncertainty over the manner of overall failure remains unless failure mode control is systematically carried out for all elements of the construction. In the 1970s a method of doing this began to be developed in New Zealand (Paulay, 1979), where it was called capacity design. This procedure requires the designer to impose a mode of overall failure on the structure, which demands that the parts of the structure (mainly beams) that yield in the chosen failure mode are detailed for high energy dissipation, and that the remainder of the structure (mainly columns) has the strength capacity to ensure that no other yielding zones are likely to occur. This principle is straightforward to apply to most structures with few members, but otherwise may be problematical. In theory, it not only helps to maximize safety but, by dictating where the damage will occur, it enables designers to improve the repairability of the structure and interacting elements. Failure mode control is generally unnecessary for single-storey structures (unless they have abnormally heavy roofs), and is considered to be unnecessary for most structures in regions of low seismic hazard. However, it is being implemented in some form of the capacity design procedure in design codes for moderate and high seismic hazard regions of countries in various parts of the world, including New Zealand, the USA and Europe. In the foregoing discussion, we have considered how to control failure modes by structuring a system in certain ways. However, these good intentions are often frustrated if elements other than the superstructure, i.e. the part normally analysed for seismic response, are not also appropriately designed and constructed. Thus, it is essential that non-structure and substructure have suitable forms, as discussed below. Finally, it is noted that failure mode control will be implemented through effective workmanship, and that the buildability of the design plays a crucial role.